Baby wearing is the experience of carrying your child in a sling or other carrier on your chest (and/or, as they get older, on your back). Baby carriers come in different materials and configurations, each with their benefits. Keeping a child close to you in a carrier is a natural practice utilized by people across time and cultures. There is something instinctual and natural about keeping babies close to our bodies in infancy. Baby wearing has many practical benefits but, more importantly, it offers a number of significant benefits for baby and caregiver. Here are eight benefits of carrying your baby in a carrier in his or her early days, months and even years. When we wear baby close to us, we learn his cues and communications so intimately. This not only allows us to get to know our child, it helps us more effectively meet his or her needs, which will support bonding, ease the transition into parenthood, and so much more. Face to face orientation between baby and caregiver offers a powerful catalyst for bonding. 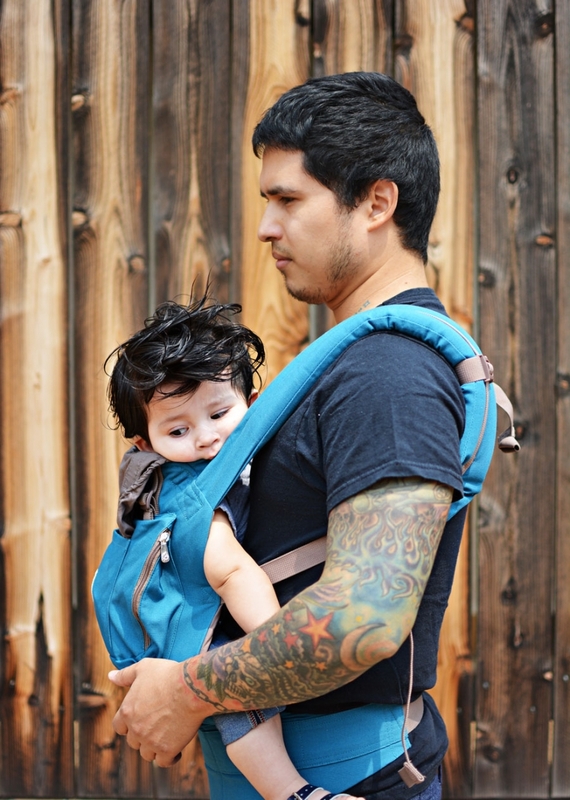 Baby wearing can be great not only for mom and baby pairs, but also for dad (or other parent) and baby pairs, and babies and other caregivers, such as relatives. It gives others an opportunity to be close to and bond with baby. Baby wearing is good for baby’s physiological systems. According to Dr. Sears, babywearing provides an external regulation system that balances the irregular and disorganized tendencies of a baby adjusting to life outside the womb, where all systems were once in harmony and regulated for them. If you think about it, the baby in utero is lulled to sleep by the rhythmic movements of his mother as she walks or moves about during the day. The gentle pulsing sound of her heartbeat and her breath are familiar and constant rhythms throughout womb life and likely offer tremendous comfort and stability. Bringing baby close to us in a carrier or just being held, reintroduces those powerful organizing environmental cues back into baby’s life—baby places her ear to mama’s chest and hears mama breathing, baby is lulled to sleep by papa’s heart beat as he carries about his morning routine, baby is soothed by the familiar rhythms of walking as mom and dad go for a neighborhood stroll. All of these regular rhythms not only comfort but also have an organizing effect on an infant’s naturally rhythmic physiological processes, such as sleeping and waking; breathing; eating, digestion and elimination; temperature; heart rate; and more. Carried and worn babies are happier and cry less. Likely connected to the phenomenon above, babies who are carried and held often are less fussy, cry less, and seem more content than those who are put into devices (such as cribs, car seats, and bouncers) most of the time. According to one study in which routine baby wearing (3 or more hours of carrying per day) was compared to a control given no instructions on wearing baby, the babies held more often throughout the day cried over 40% less. Wearing or carrying baby close helps make them secure and content. Furthermore, colic and reflux can be reduced by the upright position of being held, which can make babies more comfortable (and thus happier). Carried and worn babies learn more. When babies are not exerting their energy on crying and fussing, they are able to devote more energy into taking in and learning from their environments. Research shows that babies who are carried show enhanced visual and auditory alertness and spend more time in the quiet alert state in which they are best able to interact with their environment. Carried babies also have the opportunity to see more and experience more varied environmental stimulus at an adult’s chest level than they would if they were on the ground or in a device. Carried babies are intimately involved in their caregiver’s world and learn what human life is all about from a young age. Along those same lines, being at an adult’s chest level, babies get an opportunity to pay close attention to the subtle non verbal language used by their caregivers and by others in their shared environment. They begin to learn how social interaction works, what cues are used for different feelings and needs, and the whole dance of human social life. Carried babies also get more opportunity to observe and learn verbal language as well. Research has found that carried babies experience enhanced speech development. Many report that carried babies seem to be more tuned into and attentive toward the world around them. Babies can nap in a sling or just be with you during their waking hours, happily carried about in a soft carrier. With your hands free, you can still attend to and be close to your baby while taking care of your life responsibilities and doing things you enjoy. You don’t have to be distracted by a baby monitor or constantly stop to soothe or check in with baby. Many mamas exercise with baby in a carrier, socialize with friends or family, get household chores done, and so much more with a baby in a carrier. Sure there may be some times when baby falls asleep right before you get somewhere and leaving baby in the car seat means more rest for them while you go about your business. However, making a habit of leaving baby in the car seat can deprive you and your baby of the benefits of close physical proximity. More than this, carrying around a car seat is not easy on a caregiver’s body. Having that much weight outside your center of gravity is hard on the body and can cause or exacerbate physical pains and stresses. This is not ideal for the healing postpartum body. Holding baby close, in a carrier for example, is easier because there is no extra weight of the car seat and baby is much closer to your center of gravity, making it easier on the body to carry this additional weight. Baby carriers can run from $10-20 (used—or free!) up to about $100 or so. This is typically far less than the cost of strollers, baby bouncers, and other devices meant to hold baby. Baby carriers often last a long time and can be used from a the newborn stage into toddlerhood. These are just some of the many great reasons to keep baby close in infancy. If you choose to use a baby carrier, do some research into the different kinds, ask others for recommendations, and try them out to see what works best for you (many parents have different preferences in style. Make sure to follow safety recommendations as well to keep baby safe while in a carrier. Enjoy these precious times with baby.